When tasked with putting together a "bang-for-buck" system, the challenge is trying to find where you're willing to compromise the most. For me the motherboard and CPU take precedence over everything else. Storage and RAM are easy future upgrades, while graphics mileage varies. My target budget was $500 for the base system, though you can certainly spend less if you're willing to drop features and performance. Starting with the processor, I thought it was best to stick with Clarkdale here with a goal of staying under $150. This sent me down the Core i3 route, so unfortunately I'd have to sacrifice Turbo Boost. Usually I value this extra clock speed headroom, but the cheapest way into a boosted Clarkdale is the Intel Core i5-650 that runs at 3.2GHz and can boost up to 3.46GHz. However; $180 for a mere 266MHz gain (8.3%) is far too rich for me. The recently released Intel Core i3-560 will run all day at a very nippy 3.33GHz for $150, butmy decision was made thanks to a 15% discount bringing the similarly spec'd Intel Core i3-550 down to $130. This dual-core, Hyper-Threaded CPU balances good multi-threaded capabilities with plenty of clock speed (3.2GHz) to get through single and multi-threaded tasks (media encoding I'm looking at you). Now we need a motherboard with an LGA1156 socket. Keeping costs in mind, the Intel H55 chipset is going to be the way to go as the lack of native RAID and dual graphics card support isn't really an issue on a budget system. With a budget system, it's important to be able to grow as time goes by and more money comes your way. It's also important to try to be somewhat future-proof. I mean what's "budget" about spending another hundred bucks to upgrade in a few months time? 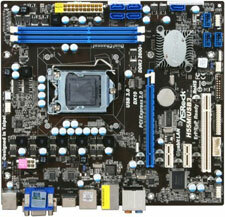 Therefore, my board of choice is the ASRock H55M/USB3 available for $85 with USB 3.0. Sure, Sandy Bridge will still require a new mobo and socket, but at least you have USB3.0 until you upgrade. Graphics is something that really depends on what the system is going to be used for. For me the integrated Intel GMA is always best avoided; it works, but I'd like a few more features thankyouverymuch. With this in mind I wanted a slim, capable, quiet card to handle media and basic gaming. I settled on the HIS Radeon 5450 card available for $55, or $45 with a mail-in rebate. While not a gaming card, it should comfortably handle any media tasks thrown at it. If you'd rather save the $45, you can leave out the card and try to live with the Intel HD Graphics, but I'm not willing to do so. Wrapping things up—or enclosing them—means I needed a case and PSU for all of these components. There's a lot of personal preference that goes into choosing a case, but splashing out on a proper GPU and Blu-ray drive left me ultimately choosing a case and PSU which let me scrape into my budget (just!). There are better power supplies out there, certainly, but I like the look of the Athenatech design and wanted a decent MicroATX case. You can add an upgraded high-efficiency PSU if you'd like, but for my budget build I'm probably already overshooting. Blu-ray or efficiency? You'll have to decide for yourself, but short-term you can use the included PSU and then upgrade to a better unit when you can afford it. $10 more will get you the Antec PSU and Cooler Master case from Dustin's build if you prefer that look. This basic system will come in just over $500. For me the CPU, graphics card, Blu-Ray drive, and USB 3.0 support should make this a more than capable PC with serious gaming being the only real stumbling block. To put it into perspective, this Pentium-powered machine with integrated graphics was what we could put together for roughly the same price in February—what a difference 9 months makes! Perhaps next year I'll finally be able to recommend an Intel PC without a dedicated GPU, especially if early Sandy Bridge testing is anything to go by. If you like comparisons, while some of the features are clearly different (i.e. Blu-ray, case, etc. 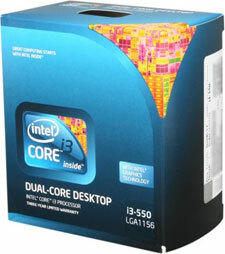 ), this Intel setup checks in at $40 more than our AMD build looking just at the motherboard and processor. It's true that Intel has plenty of less expensive processors, but rather than pitting Pentium G6950 against the Athlon II X4 645 we decided to go with the more capable i3-550. AMD's budget parts easily win in multi-threaded tests, but the Core 2010 architecture does very well in other areas. In other words, neither choice is always "right" but instead you need to decide what tasks are most important for your workload. In some of the systems, I would buy a GTX460 1GB instead of the HD6850 simply because most people play in 1920x1200 and lower (I would say 1680x1050 as the most common) and in those resolutions the GTX460 is better than the HD6850. It would be also a choice for the next generation of games, if the consoles ever let it come. Otherwise very nice systems. One question though, are all those memories you guys used from QVLs of the motherboards or do you just trust them? Any nVidia graphics card will work just as good on an AMD system as on an Intel system. How did you find that it wouldn't? That's totally false. If Zambezi isn't going to fit Socket AM3, then someone ought to tell AMD. the “Bulldozer” processor architecture for the enthusiast market.